ຊາວປາແລັສໄຕນ ຄົນນຶ່ງແລ່ນໜີ ໃນລະຫວ່າງການປະທະ ກັນກັບກອງກຳລັງ ອິສຣາແອລ ໃນການປະທ້ວງຕາມເຂດ ກາຊາ ທີ່ມີຊາຍແດນຕິດກັບປະເທດ ອິສຣາແອລ. 30 ມີນາ, 2018. ຊາວ ປາແລັສໄຕນ ຄົນນຶ່ງແກວ່ງກ້ອນຫີນໃສ່ກອງກຳລັງ ອິສຣາແອລ ໃນລະຫວ່າງການປະທ້ວງຢູ່ຕາມເຂດຊາຍແດນເຂດ ກາຊາ ຕິດກັບປະເທດ ອິສຣາແອລ. 30 ມີນາ 2018. ທະຫານ ອິສຣາແອລ ຢູ່ໃກ້ກັບຮົ້ວເຂດຊາຍແດນຝັ່ງປະເທດ ອິສຣາແອລ ທາງດ້ານເໜືອຂອງເຂດ ກາຊາ, ອິສຣາແອລ. The United States blocked a U.N. Security Council motion Saturday calling for an investigation into Israel's use of live ammunition against Palestinians participating in a mass protest along the Gaza Strip, according to a Security Council diplomat who told the French News Agency. Palestinian authorities say at least 15 people were killed Friday by Israeli forces and more than 750 were hit by live rounds. Palestinians buried their dead Saturday, with mourners calling for "revenge." 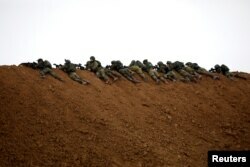 Israeli Prime Minister Benjamin Netanyahu congratulated the Israeli forces who fired at the Palestinians. "Well done to our soldiers," the prime minister said in a statement. "Israel acts vigorously and with determination to protect its sovereignty and the security of its citizens." Palestinians observed a national day of mourning Saturday. 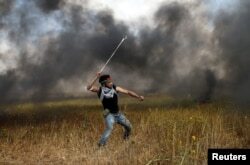 The Associated Press reports that on Saturday one of its reporters observed two Palestinian men, in two separate incidents, who walked close to the Gaza Strip border fence that separates Israel from the Palestinians.The two men were shot in the legs by the Israeli soldiers, the reporter said. In another incident, a 16-year-old boy told AP he had thrown stones with a slingshot at the fence Friday and was shot in both legs.The boy was recovering in a hospital with one leg wrapped in bandages and the other in a cast with metal fixtures, the news agency said.